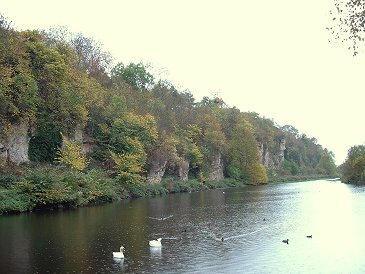 Limestone cliffs and caves on the northern face of Creswell Crags. Creswell Crags is a gorge flanked by a pair of opposing limestone cliffs that have been eroded by millions of years of water flow into a series of caves and fissures that have been utilized and inhabited by hominids for 50000 years - since the Paleolithic (Old Stone Age). The first seasonal visitors were Neanderthals who were following the herds of reindeer, bison, mammoths and horses and who would have had to compete with the lions and hyenas who were hunting the same prey. The Neanderthals would have used the caves as summer camps and have left behind flint hand axes, tools and animal bones with traces of butchery marks. Later around 30000 years ago the first modern humans began using these caves for exactly the same reasons leaving their more advanced flints as well as shaped bone and antler tools as evidence of their occupation. The last group of Old Stone Age hunters to use the caves were here around 11-13000 years ago and left a type of fine shaped flint known as Creswell Points as well as several pieces of decorated bone that include hatched patterns, a human figure and a horses head. Replica's of these can now be seen in the visitors centre. 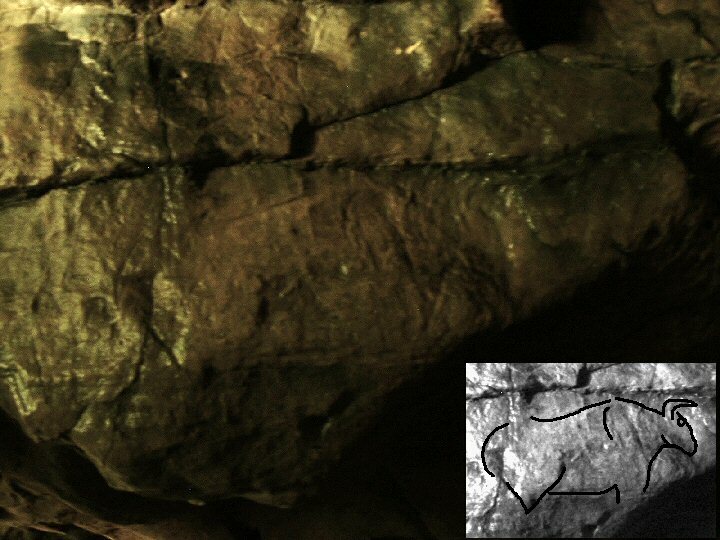 Discoveries are continuing to be made at Creswell Crags and in 2003 it was announced that the first example of British Paleolithic cave art had been found in one of the caverns. These designs consist of engravings of a pair of birds and an animal that could be an ibex, these new finds are thought to date to this final occupation phase. Finds from later periods indicate that the caves continued to be used sporadically through the Mesolithic and Neolithic up until Roman times and even into the Middle Ages but heavy handed Victorian excavations have meant the loss of much valuable evidence and the caves are now closed to visitors to protect what might remain undiscovered. 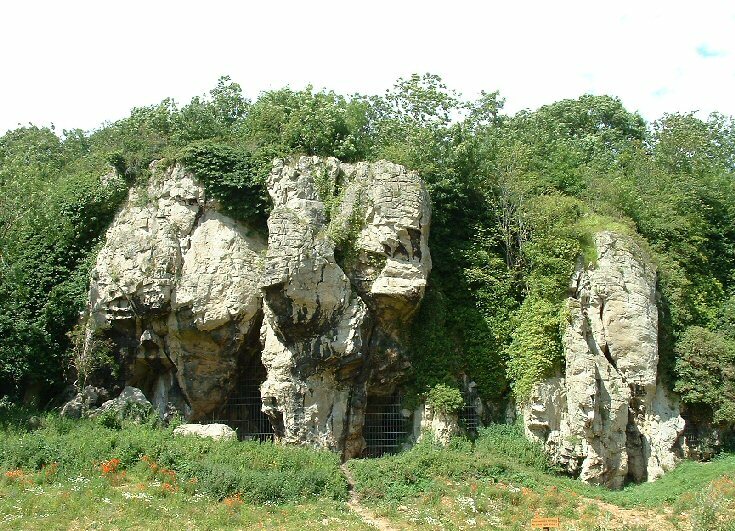 However it is still possible to enter a short distance into Robin Hood's Cave on a guided tour, for details of tours and more information about the site visit the Creswell Crags website. Looking west along the southern cliff face. 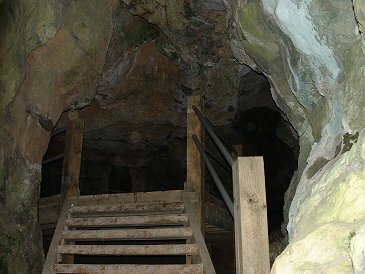 The entrance to Robin Hood's Cave. In 2004 a team of experts including Dr Sergio Ripoll, Dr Paul Pettitt, Dr Paul Bahn, and Dr Francisco Muñoz reassessed the carving in Church Hole Cave and discovered more than 80 engraved figures in the rock - they are thought to date from around 11000 BC. 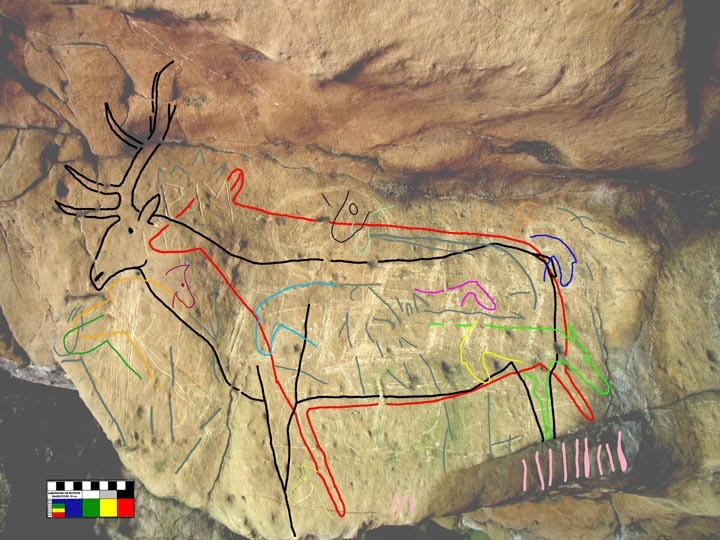 The publicity photograph below shows some of these carvings, with various animals and features highlighted in different colours for clarity. 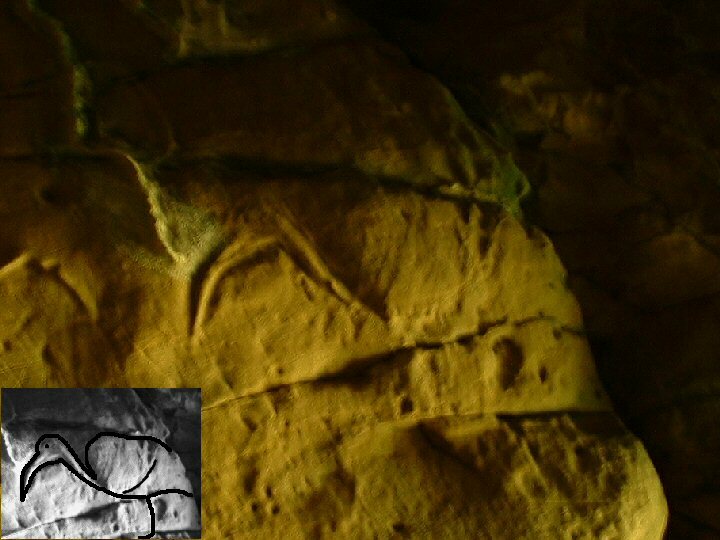 I revisited Creswell Crags in 2007 specifically to see the carvings in Church Hole Cave. The guide on the tour does an excellent job of highlighting the figures carved on the walls and ceilings of the cave which at first sight are almost impossible to make but once you 'get your eye in' slowly become clear. The figures in the image above are faint in real life but the stag is certainly fairly easy to visualize and as the panel is close to the entrance of the cave it receives some daylight to illuminate it but a little further back the cave gets very dark. The two pictures below show my favourites of the art that we were shown, both are in semi darkness so the photographs aren't particularly clear (I've shown my interpretation of the carving alongside) but the bird figure, thought to be an ibis, is clearly recognisable. It is carved in 'bas-relief' meaning the carver cut around the outside of the figure to leave it standing slightly proud of the rock surface. The bottom image shows what could be a bison, this carving is quite small and was difficult to make out initially but as it is just above the visitors head it is quite an experience to realize you are probably standing in the same spot as the person who carved the animal 13000 years ago. Many of the figures make use of existing rock features such as cracks, holes and fissures to form parts of the animals so it could be that the people using these caves for shelter were looking up at the walls in flickering firelight and the natural marks on the rock slowly began to suggest figures in their minds eye which they then enhanced to bring these animals to life on the rock surface. It would be fascinating to know whether they went on to use red and yellow ochre and black charcoal to further breathe life into these figures. A bas-relief carving of a bird, possibly an ibis, in Church Hole Cave. The faint outline of a bison-like creature can be seen using my interpretation as a guide.